A man stands in front of a tunnel leading from the street to a courtyard. He is wearing a crumpled suit and trilby hat. Thick lenses refract the bright sunlight falling on his face, obscuring his eyes. Right hand limply by the side, cigarette stub in the left pointed at the viewer. The arch above his head is inscribed Bethel C. M. Church: Calvinistic Methodists. Above that, crossed by telegraph wires, Breconshire Coal & Lime Company Limited. Now, sheltered under the arch, switch hands, back to a graffitied wall, sunlight reflected back into a glassy stare. Cut me up and call me Burroughs. Unknown portraits of William S. Burroughs and printed matter. 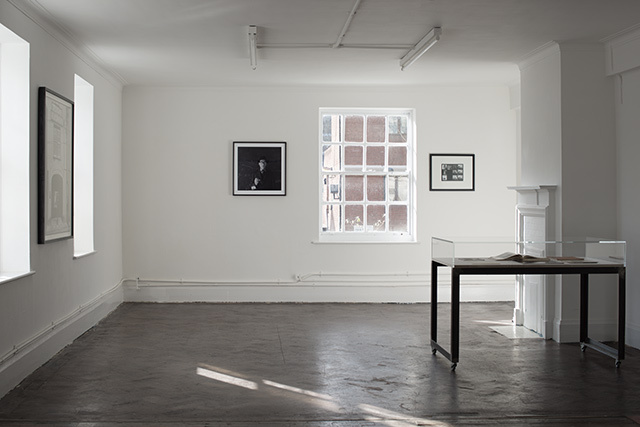 The exhibition opened on 5 February 2015 on William Burroughs' 101st birthday with live radionics by Dan R. Wilson, transmissions by the International Necronautical Society and videos The Creator by Al and Al and Burrow by Louise Ashcroft, organised by Toby Clarkson.